Our Navy Officer Ceremonial Sword Belt is made from Black leather with a gold plated buckle. 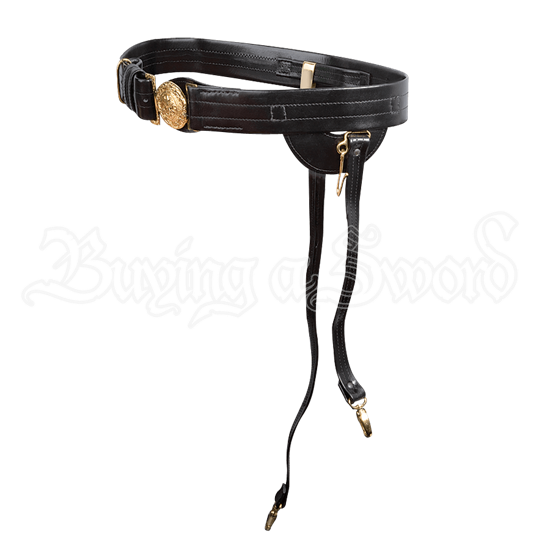 The belt comes with two attached clips that are the perfect length to hang your Navy Officer Sword from, or any other sword that has rings on its scabbard. This belt was designed for use with the Navy Officer Sword, but works well with other compatible military swords as well. The belt width is 1.75 inches. It is available in waist sizes 30-34 inches, 36-38 inches, and 40-44 inches. For the most accurate measurement, measure your waist over your uniform. Measure over your uniform. Available in Small - 30-34 Inches, Medium - 36-38 Inches, and Large - 40-44 Inches.